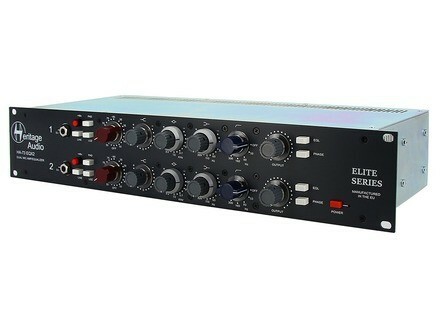 HA73EQX2 Elite, Préampli à transistors de la marque Heritage Audio. Microphone input impedance: HI, 1200 Ohm minimum, LO, 300 Ohm minimum. Higher gain positions gradually have greater impedances, optimum for low gain ribbon mics. Input is transformer balanced and floating. Line input impedance: 10KOhms bridging, transformer balanced and floating. Output impedance: Less than 75 Ohms, transformer balanced and floating, to drive a load of 600 Ohms. Maximum output: Greater than +26.5dBu into 600 Ohms (internally terminated). THD: Less than 0.025% at 1Khz, Less than 0.05% at 100Hz. Frequency response :20Hz (+0.3dB) to 20Khz (-0.2dB). EQ Off. For EQ ON frequency response please check the features section. Maximum Gain: Slightly greater than 80dB. Equivalent Input Noise: Less than -125dBu. Output stage noise: Less than -100dBu. Power consumption: Less than 190 mA @48VDC. Heritage Audio vous offre une double ration de son préampli micro et égaliseur HA73 avec le nouveau HA73EQX2 intégré à la série Elite.